No longer available, except as a replacement part for people who have ordered previously. Please check out TinyIR2. Adding IR remote control to your next project, or to an existing one just got a whole lot easier. With TinyIR, just apply power, train the chip to recognize the IR remote control commands you want to use, and you're ready to go. Command patterns are safely stored in internal non-volatile EEPROM. TinyIR can be re-trained many times if needed. By installing one or two external passive components you can configure 0,1,2,3, or all 4 of the outputs as momentary, and the rest as toggle. Momentary outputs pulse high for approx 100 mSec when their command is recognized. Toggle outputs change state when their command is recognized. If you need more than four outputs, add an expansion chip (a standard 74HC259) to get eight outputs. You can configure 0,1,2,3,4,5,6, or all 8 outputs as momentary, and the rest as toggle. Based on an 8-pin Microchip ® PIC 12CE519 CMOS microcontroller with EEPROM, TinyIR was developed to work with most modern IR remote controls. It supports bi-phase, pulse width, and pulse position encoding techniques. All 4 or 8 codes must be in the same "family", such as a number of different keys on the same remote would be. In addition to the TinyIR chip, we offer several complete kits, containing double-sided PC boards and all components needed to populate them. No longer available. I am out of pc bds, and don't want to order more as TinyIR2 is a newer and better design. 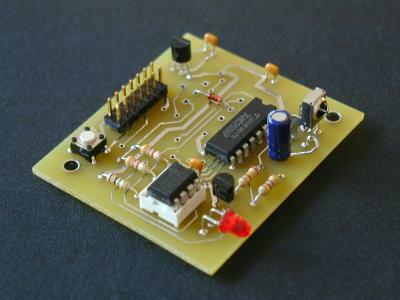 Remote IR sensor board for use with above pc boards. 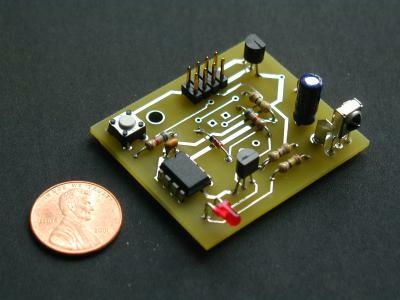 (Photo shows RS1 connected to four channel board.) IR sensor, and its bypass capacitor are mounted on a small pc board, which is connected to main board with a 3-conductor ribbon cable. This is useful when it is necessary to mount just the IR sensor in a location where there is insufficient space for the main board. PC-RS1 board is 0.5" x 0.75". 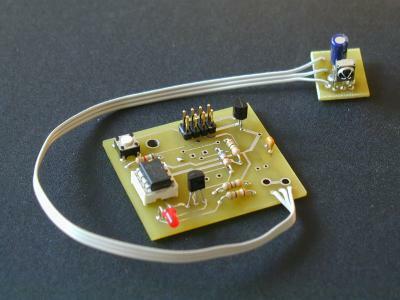 Since the IR sensor output is open drain with an internal pullup resistor, multiple sensors can be connected in parallel, and faced in different directions to increase reception angle. This has not been tested extensively, but we have tried a sensor on the main board in parallel with a single remote sensor board, which allowed IR signals to be recognized over a much larger angle. Includes 8" 3-conductor ribbon cable. Receiver and capacitor mounting is the same on RS1 as on the 4-CH or 8-CH boards. Please download connection diagram. Note: All parts needed to populate pc boards, except TinyIR chip, can be purchased at www.Digi-Key.com, or you can purchase one of our complete kits.